Growth mindset is a term coined by Stanford psychologist Carol Dweck. Maybe you have never come across it previously; perhaps you have but have not yet explored what it could mean for you and your company. Either way, focussing on creating a growth mindset within your company will give you motivated, high-achieving and happy employees, leading to a more successful business. Your mindset revolves around your beliefs about your intelligence and how it can be affected by learning. A fixed mindset will tell you that intelligence is static. The desire to look smart causes the person to avoid any challenges and to give up when they come across obstacles. They are very focussed on their reputation, meaning that constructive feedback can trigger an emotional response as it is taken personally. Hard work and effort are seen as pointless as the person believes that they have reached their full potential. This makes them resistant to change, preventing them from developing. A growth mindset stems from the understanding that your abilities and intelligence can be developed. They believe that effort leads to a stronger performance and so embrace challenges. They learn from criticism and utilise it to keep bettering themselves. They work hard and seek opportunities to learn, which results in them continuously developing and moving closer to reaching their full potential. Why is it necessary for your team to have a growth mindset? There are many reasons why having a growth mindset is necessary for your team. Firstly, when the boss of a company has a fixed mindset they tend to fear appearing inferior and so can’t accept criticism. They become controlling and which then puts employees in a fixed mindset. Everyone worries about being judged, and so the emphasis is taken off of learning and growing as a company, and is instead focussed on pleasing management. Additionally, it has been repeatedly demonstrated in schools that praising a student based on their processes used to get to a goal, rather than their existing ability to complete a task, leads to increased educational development and higher achievement. We can apply this same basis to adults within a workplace. Now more than ever, employees feel less tied to their employers and are increasingly ready to job hop. They not only choose to remain in a role based on its salary, but also by the opportunities they have had for development and how valued they feel in their job. 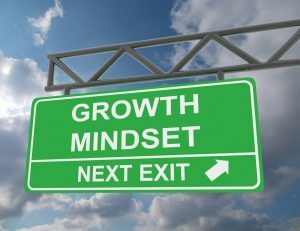 Generating a growth mindset will improve the quality of work environment, reducing employee turnover and resultantly saving you money. What can you do to create a team with a growth mindset? Firstly, you need to identify where in your team you have fixed mindset tendencies. You can then focus your time on coaching those individuals. Telling your employees that they have reached their potential may lead to a fixed mindset, so instead you should focus on praising their hard work and effort. Managers often avoid giving constructive criticism due to the fear of offending employees or damaging their confidence. Nevertheless, it is important to overcome misconceptions about feedback and make it a top priority in your company. Be available for employees when they want to discuss their development with you, and follow up with them afterwards. Regular informal meetings will ensure you can effectively monitor any development and it will mean that employees are more likely to approach you for advice and support. The best way to lead change is to demonstrate that change. Set an example by asking for feedback to create an open environment, and by not being defensive about your mistakes. Encourage your employees to use senior management as a source of learning and guidance, not just feedback. Present skills as learnable and reward those who undertake training and try to better themselves. In group discussions, you can remove any reluctance to make suggestions by encouraging nominated participants to present opposing views to those already suggested (even if they were suggested by you!) This gives employees the freedom to put forward ideas without fearing negativity. Promote learning by enrolling yourself and your team on workshops and training sessions. Through our coaching sessions, Amanda Murrell Associates can help you to achieve that growth mindset for yourself and your employees. Contact us to find out more. Prev:Bedfordshire’s Entrepreneur of the Year bucks the trend! Next:Is getting a coach at the top of your Christmas list?